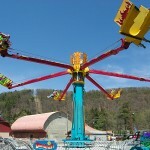 The ride consists of 6 arms, each carrying 4 people, which undergo a fast rotation combined with a series of fast-paced bounces. 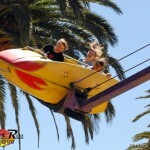 This gives riders of all ages a fun, action-packed ride as the bouncing arms expose the rider to varied speeds and centrifugal forces, as well as feelings of weightlessness. Underneath the centre post is a giant compressed air cylinder that is connected at the top to the 6 arms. At the completion of each bounce, the operator activates a control that releases air in the cylinder, causing the arms to fall again. 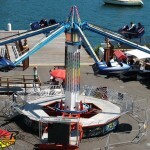 A carnival is not complete without the familiar scene of the cars sweeping over the heads of passers-by, with the loud bursts of compressed air that go hand-in-hand to the classic hurricane ride. Dartron has since released a variationt of the Hurricane: Downdraft using a semi-suspended seating configuration with increased capacity of 6 per car. There are approximately 40 hurricanes in North America, 8 in Australia and 3 in New Zealand with never-ceasing popularity amongst the young and old. 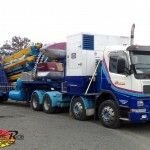 The ride racks up on a single trailer and can be set up in around 2 hours. I used to run one of these. I was the best ride to run,setup, and teardown. Went on this first time today. 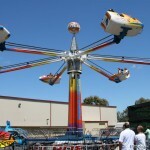 Was the best ride I have ever ridden at a Carnival. I just love it. 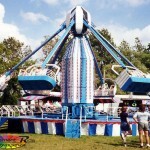 I have been trying to find this ride in Louisiana for years, it use to come to neighborhood park every year when the fair was going on. Looking at the videos of it just took me back and I laughed just hearing the sound and the screams on the ride. It was simply the best. If any one know of a way to find out where the hurricane will appear again please inform asap if its in New Orleans or somewhere close. im on it waiting for it to start with my online cellie! here we go! aahhhhhh. i cant breth vary good. luv the hurrrican blibem my lips in da wind darn phondis ringin muzt be mom… talked to mom on the hurricane ride. she wondered what i was doing. i said i was on a ride. she laughed! The old school, original Saturn 6 Hurricane was amazing to ride and watch – especially at night! 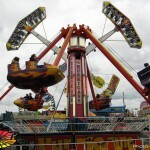 The Hurricane and the Spider(Breakdance) are my FAVOURITE RIDES EVER!! The hurricane literally takes my breath away! 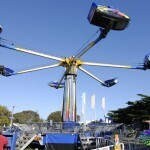 Just rode one about 2 weeks ago at a local carnival. Just as fun as I remember. Great ride. One of my favs. I ran 3 different Hurricanes 2 Hrubetz hurricanes (1972 and 1974) and a 1978 Kilinski Hurricane, which in my oinion was the best of them all! If anyone should happen to be looking at these rides for sale…my suggestion is to go for the Kilinski! You will be happy with it! buenas tardes. investigando en internet localize esta pagina en donde se exiben diferentes tipos del juego mecanico “hurricane” mi intencion es adquirir un juego de este tipo. si alguien sabe de alguna persona que venda uno por favor comunicarse a mi correo gracias. queretaro mexico. @ james smith…I also ran Rainier’s Hurricane for a short time in 1991. That was the 1974 hurricane I mentioned. 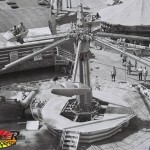 The ’72 belnged to Funtastic, and the ’78 Kilinski Hurricane belonged to Playland Shows…which is now with Haworth Family Fun Shows…its been painted and renamed “Vortex” but its still my old Hurricane! Here I am! Rock you like a hurricane! Na na na na na! 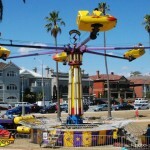 What kind of music does this ride play? 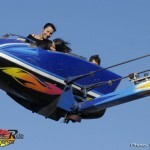 does any one have an owners manual or a spec sheet on this ride…. They have one at the I-X Center in Cleveland, Ohio. Its fun and the sound is really fun. So Kevin invented the Hurricane ride. Hey what’s up?Man the Hurricane is my favorite ride of ALL TIME,Can yall bring this ride somewhere down here in New Orleans Louisiana?Thanks a lot!!! !